Former Solomon Islands diplomat Rex Horoi is expected to be appointed his country's special envoy on West Papua at the Melanesian Spearhead Group (MSG). Solomons Prime Minister, Manasseh Sogovare, has intimated that Horoi - outgoing Director of the Foundation for the Peoples of the South Pacific - will take up the pots shortly. Horoi will be responsible for ensuring MSG support for West Papua's inclusion in the United Nations Decolonisation list commonly known as the C24. Under a Solomon Islands plan designed last year, the country was to have appointed a special envoy to lobby Pacific island governments to support West Papua's inclusion on the list. 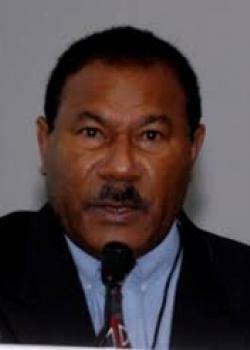 The Solomon Islands was also expected to appoint Fe'iloakitau Tevi - former General Secretary of the Pacific Conference of Churches - as adviser to the special representative. Most MSG countries support decolonisation of West Papua which was invaded by Indonesia in 1961 after the UN, Indonesia and the United States manipulated a referendum in the former Dutch territory. Meanwhile, Indonesia is likely to charge to West Papuan activists with treason for opening an office in Wamena. Edison Waromi and Markus Haluk have been summoned by Indonesian police to be questioned over the opening of the United Liberation Movement for West Papua Office in Wamena. Pembela Hak Asasi Manusia di Papua) and anticipate the men will be charged with treason. Indonesia is in the process of opening an embassy in Ramallah on Israel's West Bank.